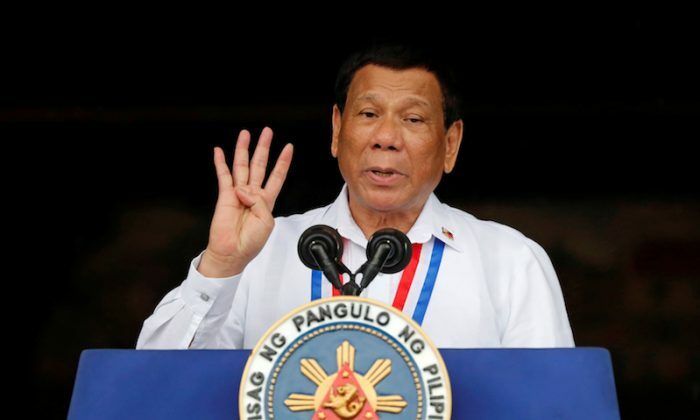 MANILA—The Philippines is planning to take President Rodrigo Duterte’s ferocious drugs war to schools with the inspection of bags and lockers, as well as random testing for teachers, to curb demand for illegal substances, officials said on Friday. The firebrand leader unleashed an anti-narcotics campaign after coming to office in June 2016, during which police have killed more than 4,200 suspected drugs dealers and users. Several thousand more have been killed by unknown gunmen, who authorities have described as vigilantes or rival gang members. Rights groups and critics of the campaign say some of the killings were summary executions. Police deny such allegations, saying they had to use deadly force because the suspects were armed and had resisted arrest. Law enforcement agencies are planning to step up the drugs campaign by proposing random drug testing in primary schools on teachers as well as on 10-year-old fourth grade students, moves which the education department vehemently opposed. Catalino Cuy, the head of the policy-making Dangerous Drugs Board (DDB), said his office would study the proposal to strengthen the drug prevention campaign in schools and issue a policy to ensure its proper implementation if needed. “Drug prevention programs in schools are already in place. These have proven to be effective in deterring drug use and instilling the importance of leading a healthy and drug-free lifestyle among students,” Cuy said in a statement. Consultations with schools, parents and other members of the DDB board, which include the education ministry, will be done to ensure rights of students are protected and their safety is guaranteed, said DDB public relations officer Ella Marie Dimaculangan. “The Department of Education observed that the proposal of the Philippine Drug Enforcement Administration (PDEA) to test all students age 10 and older may require the amendment of the Comprehensive Dangerous Drugs Act of 2002, which authorizes drug testing for secondary and tertiary level students only,” it said in a statement. Education Secretary Leoner Briones was also seeking a meeting with the head of the drug enforcement agency to discuss the department’s drug prevention program. He said they also wanted random testing for grade school students aged from 10 to 12 after some children had been “rescued” from drug dens during police raids outside Manila.